Leaves of tropical crops like chaya (Cnidoscolus aconitifolius) and cassava (Manihot esculenta) contain cyanogenic glycosides, toxic substances that release hydrocyanic acid (HCN; also referred to as cyanide or prussic acid) when cells are crushed. Consuming these plants without cooking them can cause cyanide poisoning, with effects that vary depending on cyanide levels and how long a person or animal has been eating that plant. An information sheet from the New Zealand Food Safety Authority describes cyanogenic glycosides in plants and their effect on human health. To determine if a plant is safe to consume, a simple cyanide screening test using Cyantesmo paper is very helpful. Cyantesmo paper can be cut into short strips and placed in a sealed bag or container along with plant material, to detect the presence or absence of HCN. If the paper turns blue, HCN is present. The color change is not specific enough to indicate parts per million; however, smaller concentrations of HCN will result in a lighter shade of blue than higher concentrations. See EDN 130 for more information on how to use Cyantesmo paper. To answer Karis’s questions, we repeated the 2015 trial in June 2017 with the addition of chaya petioles, green stems and roots. (Roots are not commonly consumed or recommended for consumption, but we included them in order to understand plant allocation of cyanogenic glycosides throughout plant tissue.) 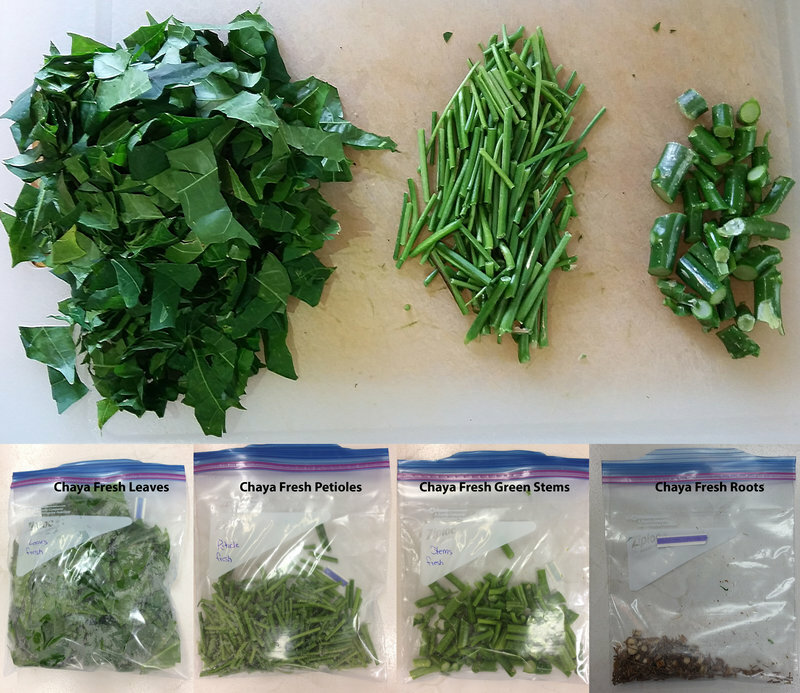 Eighty grams each of fresh chaya leaves, leaf petioles, and green stems were chopped up and placed in quart-sized Ziploc® bags as shown in Figure 6. Due to limited quantity, only forty grams of fresh chaya roots were chopped up and used. To determine for how many minutes each plant part needs to be boiled in order to be safely consumed, eighty-gram samples of chaya leaves, petioles and green stems were boiled separately in one liter of water for 10, 15, and 20 minutes. Forty-gram samples of chaya roots were boiled in one-half liter of water for each time interval. For prolonged boils, extra water was added as necessary to keep roots covered with water. After boiling, samples were placed in Ziploc® bags with test strips. Figure 7. Results from second experiment determining safe cooking times for chaya petioles and stems. Roots are not consumed, but show lower cook time for cyanogenic compound removal. Results shown in Figure 7 confirm the previously determined safe cooking time of 20 minutes for chaya leaves. Results show that chaya petioles and green stems also require a boil time of 20 minutes to remove cyanogenic compounds. Although fresh roots indicated high concentrations of HCN release, a 10-minute boiling time reduced cyanogenic compounds substantially in root material. Some ECHO staff members recommended checking the cooking water, to determine if the water is safe for consumption after boiling chaya plant parts. We repeated the trial, again using 80g of chaya leaves, petioles and green stems boiled in one liter of water and 40g of chaya roots in one-half liter of water. After boiling for the recommended 20 minutes to remove cyanogenic compounds from each plant material, we brought the remaining water back to a boil, then removed the pots from the heat source. We fixed lids with two strips of Cyantesmo paper using clear tape, and put them on the pots. Papers were left on the lids for 17 hours before the color was checked. Results show that only water used to cook chaya leaves still contained trace amounts of cyanogenic compounds. This trace indication may have come from leaf residues stuck to the pot. We have additional questions about chaya, outlined below. If you have input about these, or have your own questions, please share your ideas with the network in the chaya category of ECHOcommunity Conversations. A combination of chopping and 3-day wilting before drying was effective in lowering the cyanide concentration of cassava leaves from 1436 to 55 ppm HCN (Ravindran 1987). Chopping and wilting might have a similar effect for chaya leaves. Ravindran, V., E.T. Kornegay and A.S.B. Rajaguru. 1987. Influence of processing methods and storage time on the cyanide potential of cassava leaf meal. Animal Feed Science and Technology 17(4):227-234.